WASHINGTON—Several national consumer and civil rights groups, including organizations like the Consumer Federation of America, Leadership Conference on Civil and Human Rights, League of United Latin American Citizens (LULAC), NAACP, and the National Association for Latino Community Asset Builders, joined the growing voices of dissent against the Consumer Financial Protection Bureau’s proposed delay of a 2017 rule the agency had issued to stop payday and car title loans from trapping consumers in debt. The groups signed a joint letter to the new CFPB Director Kathy Kraninger that rebuts the agency’s rationale for the 15-month delay of the payday rule, which the agency is pushing to drastically weaken by removing the prerequisite that lenders verify borrowers’ ability to repay a loan. At her second hearing before Congress, March 12, Ms. Kraninger struggled to explain why she issued a plan that would gut a rule designed to protect Americans from “debt trap” payday and car title loans. Ms. Kraninger said reconsideration of the underwriting standards, making sure people who borrow payday loans have the ability to repay them, the Payday Rule was to determine if the legal and factual basis used to justify certain practices as unfair and abusive was “robust” enough. She told Congress that the Bureau would review all public comments which were due on March 18, to the proposal and that the evidence used for the original rule will be part of the record for the reconsideration. The organization’s letter to Director Kraninger started with a story about Arthur, a 69-year-old warehouse worker and grandfather of seven, who started with a loan of $200 from Advance America. The loan eventually increased to $300. Every payday, rather than defaulting or coming up short on bill money, Arthur went into the Advance America store and paid a fee of $52.50 so Advance America would not deposit his check for the full loan amount. Advance America flipped the loan over a hundred times, until his total interest paid was an estimated $5,000. The clerks knew him by name and often had his paperwork ready for him when he came in. 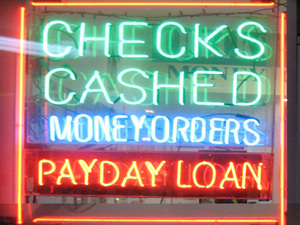 Payday lenders have a name for consumers they see every payday: “26ers”—because they pay up every two weeks, 26 times a year. In Arthur’s case, they saw him once a month rather than every two weeks, but only because his repayment came from his monthly Social Security check. As the letter explained, “Payday and vehicle title loans are debt traps by design. The lender takes control of a coercive payment device—access to the borrower’s bank account or the title to their car. They make a loan due in full, typically on the borrower’s next payday. The borrower is typically unable to afford the loan, plus the high fee.